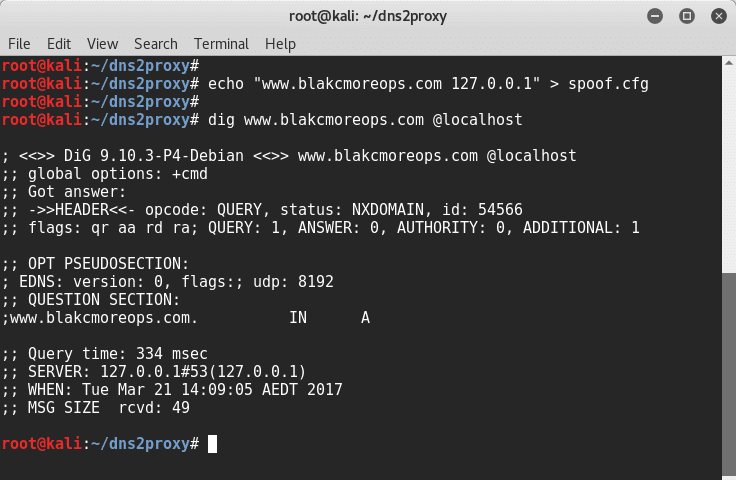 dns2proxy is an offensive DNS server that offers various features for post-exploitation once you’ve changed the DNS server of a victim. This tools offers different features for post-explotation once you change the DNS server of a Victim. 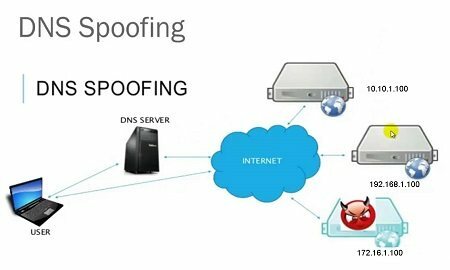 DNS spoofing, also referred to as DNS cache poisoning, is a form of computer hacking in which corrupt Domain Name System data is introduced into the DNS resolver’s cache, causing the name server to return an incorrect IP address. This results in traffic being diverted to the attacker’s computer (or any other computer). dnspython (www.dnspython.com) is needed. Tested with Python 2.6 and Python 2.7. You can simply clone git and start working. You need to start dns2proxy and bind it to an interface IP address. Usually this is eth0 interface. binded to UDP port 53. This feature implements the attack of DNS spoofing adding 2 IP address at the top of the resolution and configuring the system to forward the connections. Check slides at BlackHat Asia 2014 OFFENSIVE: EXPLOITING DNS SERVERS CHANGES and the Demo Video. To launch this attach there is a shellscript that automatically configure the system using IP tables. You must edit this file to adapt it to your system. DON´T FORGET AdminIP variable!!!! Hostnames at nospoof.cfg will no be spoofed. Automatically the dns server detects and correct the changes thats my sslstrip+ do to the hostnames to avoid HSTS, so will response properly. This server is necessary to make the sslstrip+ attack. nospoof.cfg: Send always a legit response when asking for these hosts. nospoofto.cfg: Don’t send fake responses to the IPs listed there. victims.cfg: If not empty, only send fake responses to these IP addresses. resolv.conf: DNS server to forward the queries. Many cache poisoning attacks against DNS servers can be prevented by being less trusting of the information passed to them by other DNS servers, and ignoring any DNS records passed back which are not directly relevant to the query. For example, versions of BIND 9.5.0-P1 and above perform these checks. Source port randomization for DNS requests, combined with the use of cryptographically-secure random numbers for selecting both the source port and the 16-bit cryptographic nonce, can greatly reduce the probability of successful DNS race attacks. However, when routers, firewalls, proxies, and other gateway devices perform network address translation (NAT), or more specifically, port address translation (PAT), they may rewrite source ports in order to track connection state. When modifying source ports, PAT devices may remove source port randomness implemented by nameservers and stub resolvers. Secure DNS (DNSSEC) uses cryptographic digital signatures signed with a trusted public key certificate to determine the authenticity of data. DNSSEC can counter cache poisoning attacks, but as of 2008 was not yet widely deployed. In 2010 DNSSEC was implemented in the Internet root zone servers.